Phil Rowley and Brian Chan have announced the release of their Stillwater Fly Fishing App, packed with educational tips for fly fishing for trout in stillwaters. The app is available through both Google Play and iTunes. Have you ever wanted to spend a day on the water with Phil Rowley and Brian Chan? Here’s your chance to have them join you! Phil Rowley and Brian Chan, two of North America’s most respected Stillwater fly fishers, are excited to announce the release of their long-awaited Stillwater Fly Fishing App. Phil and Brian have combined their 75 years of experience fly fishing for trout and char in lakes to develop this valuable educational tool. This App will become an essential tool in the toolbox for anglers of all skill levels. The app is broken down into six chapters covering such topics as the freshwater fishing regulations for all states and provinces, entomology, leaders and knots, techniques and tactics, equipment and favourite stillwater flies. Each topic is presented in video format that can be easily downloaded and saved to your mobile device. Once downloaded, the video tips can be watched anywhere. No Wi-Fi connection is required to view the tips once they have been downloaded. These are just a small sample of the over 75 tips provided in the initial launch of this App. New tips will be added monthly, so you can continue to increase your knowledge base and most importantly put them into use when you are on the water. 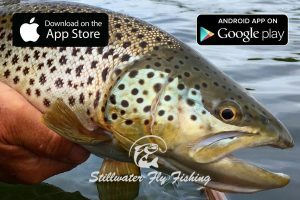 Please visit iTunes (Apple devices) or Google Play (Android devices) to download this wealth of stillwater fly-fishing knowledge and improve the quality of your time on the water.